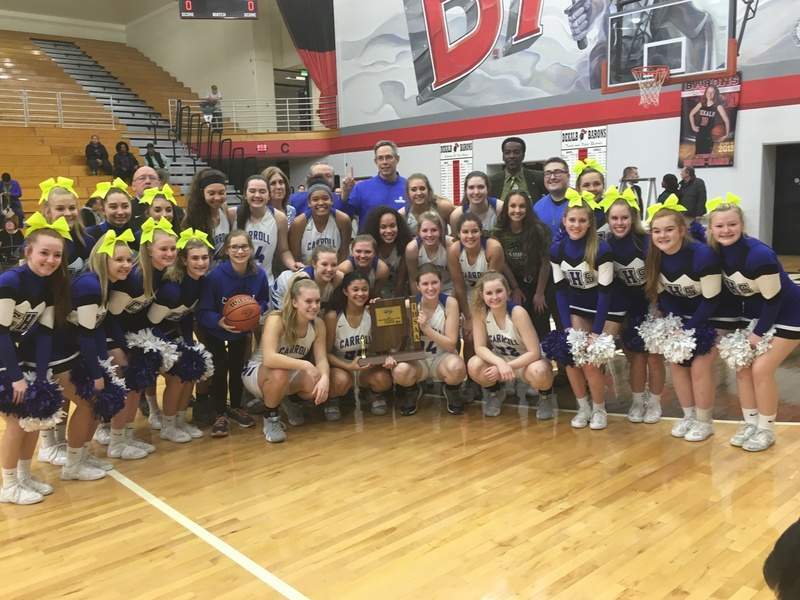 WATERLOO – For the first time in program history, the Carroll girls basketball team has won three sectional championships in a row. Despite starter Olivia Hoeppner missing the game with an illness, the Chargers overcame a third-quarter deficit behind a huge 32-point performance from Malia Williams and 16 points for Delane Sheets to defeat Northrop 61-48 on Monday and capture the Class 4A sectional title at DeKalb. It was the second straight season the Chargers (14-9) beat the Bruins (13-10) to win the sectional. Chants of “We are Carroll” echoed through the gym in the closing seconds as a pro-Chargers crowd made its excitement felt. The game was a back-and-forth affair until midway through the third quarter, when Williams took over. The junior guard nailed a pair of high-arcing 3-pointers from the top of the key on back-to-back possessions, turning a tied game into a 35-29 Carroll lead and forcing Northrop to burn a timeout. At the start of the fourth quarter, it was Williams extending the lead again. She started the quarter with a driving layup, then immediately added another layup on the fast break after a Northrop turnover. The latter basket made it 43-32 and the Bruins again called timeout. After the break, Northrop went into a full-court press, but Williams broke it and raced down the middle of the court, drawing a crowd of defenders before dishing off for another layup that essentially put the game away with five minutes to go. Williams had 24 points in the second half. The Chargers got a setback earlier in the day when Hoeppner came down with the flu and realized she wouldn't be able to play. Despite her illness, she was on the bench supporting her team. When she climbed the ladder to cut her piece of the net, her teammates cheered in unison. “That's why I love my team,” Hoeppner said. Carroll made history with its third straight sectional title, but it came with an almost completely different roster than the veteran-laden one that captured the first two. This group is just getting started. As a reward for their championship, Carroll gets the honor of meeting top-ranked Hamilton Southeastern (23-1) at the Kokomo Regional on Saturday. Redding didn't want to let that daunting task ruin the celebration.